I have been in California visiting my son, who is a doctoral student at Berkeley. The bright blue skies and warm temps have been a needed break from February in Ohio with its gray skies and cold winds. What a nice time we have had! Another highlight of my visit – besides getting to see my boy – was a trip to the de Young Museum at Golden Gate Park in San Francisco. 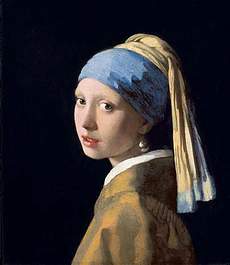 There I had the joy of seeing Vermeer’s masterpiece Girl with a Pearl Earring. What a thrill, a true Vermeer masterpiece, lush in painted technique, insightful in its mysterious, personal appeal. Woo hoo! This entry was posted in Pip's BLOG and tagged art, Berkeley, California, de Young Museum, Girl with a Pearl Earring, Golden Gate Park, Marsha Pippenger, painting, San Francisco, Vermeer on March 2, 2013 by Marsha.